Tomorrow, in a pregame ceremony, longtime Milwaukee Braves shortstop Johnny Logan will be honored with a plaque at the Walk of Fame at Miller Park. 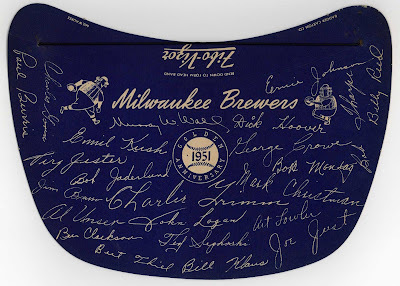 Press conference scheduled for 4:15 p.m., on-field ceremony starts at 6:40 p.m.
MILWAUKEE – Former Milwaukee Braves shortstop Johnny Logan will be honored on Thursday as the newest member of the Miller Park Walk of Fame. In January, the Brewers announced Logan received over 72% of the vote (32 votes) in Walk of Fame balloting, which includes members of the media throughout Wisconsin as well as Brewers executives. Logan's election marks the first time since Lew Burdette (2010) that a player will be inducted. 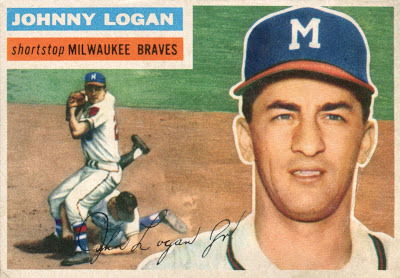 Logan played in Milwaukee from 1953 – 1961 and appeared in four All-Star Games as a member of the Braves. For his 13 year career, Logan hit .268 with 93 home runs and 547 RBI. He was a member of the Braves World Series Championship team in 1957 and the National League Championship team in 1958. 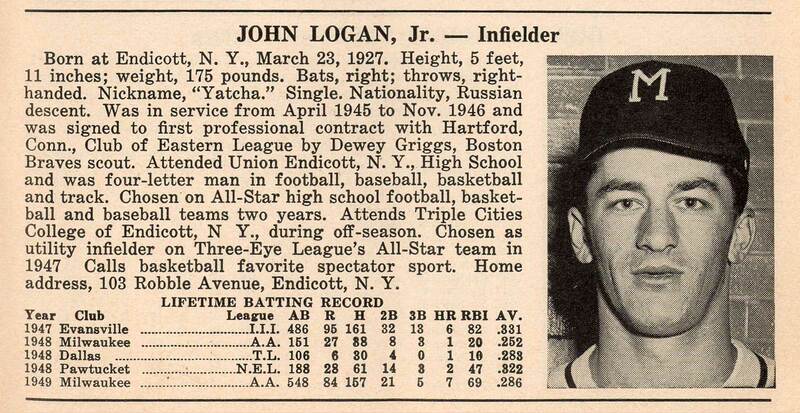 Logan was signed by the Boston Braves in 1947 and made his Major League debut with Boston in 1951. After playing in Milwaukee, he played three seasons with the Pittsburgh Pirates. Other past winners of the award include Hank Aaron, Rollie Fingers, Paul Molitor, Robin Yount in 2001; Commissioner Bud Selig and Cecil Cooper in 2002; Bob Uecker and Harry Dalton in 2003; Jim Gantner and Gorman Thomas in 2004; Don Money and Harvey Kuenn in 2005; Eddie Mathews, Warren Spahn and John Quinn in 2007 (the first year that former Braves players appeared on the ballot); and Lew Burdette in 2010. All of that is good. All of that is true. But it doesn't tell the complete story. It neglects to mention, for example, that Logan "played in Milwaukee" before 1953; before he was a Brave, he was a Brewer. Logan's start in Milwaukee was inauspicious. He came back to Borchert Field in 1948 from the Evansville Braves of the Illinois-Indiana-Iowa League. In this program from that season, Logan is listed as a "utility player", assigned #2. Logan struggled with the Brewers, and on June 24th was sent down to the Dallas Eagles. He performed well in Dallas, well enough to earn another shot at Milwaukee the following spring. He was taking over for Alvin Dark, who in one single season at Borchert Field had set a pretty high bar for Brewer shortstops. Logan reportedly clashed with longtime first baseman Heinz Becker, who would "give it" to Logan when the young man sent a wild throw to first. It got so bad, Sentinel scribe Red Thisted reported, that the Brewers had to ship Becker to the Seattle Rainiers. Logan was, after all, the future, and although Becker was beloved in Milwaukee, his career was winding down. 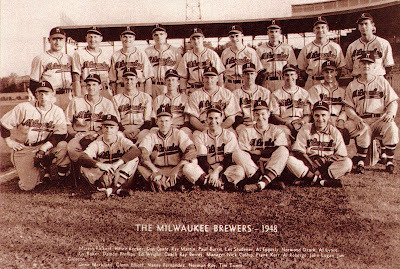 The Brewers replaced Becker at first with soft-spoken Nick Etten in 1949. Etten was just what Logan needed, never reproaching him no matter how many times the youngster bounced throws to first. 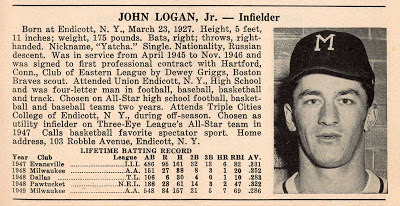 Logan thrived as the regular shortstop, racking up defensive averages behind only Bill Costa of Columbus in the American Association. He was involved in 111 double plays, also second best in the Association, with a "respectable" batting average of .286, 69 RBI and 14 home runs. 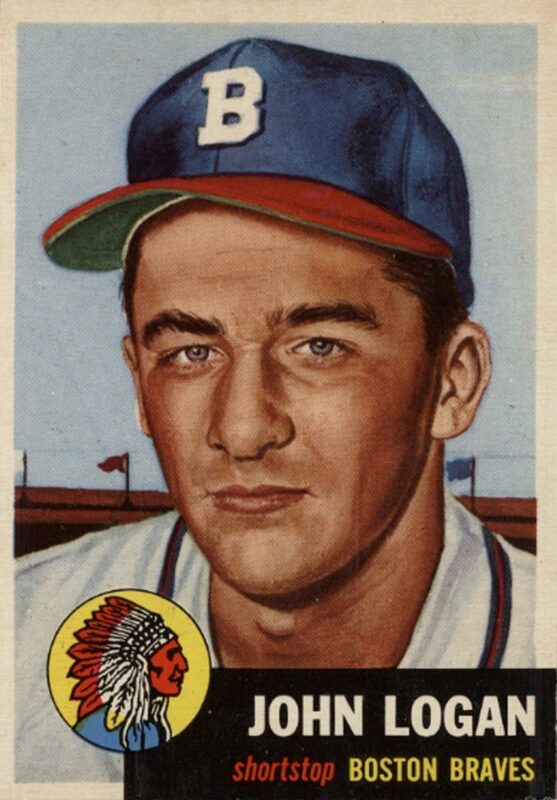 In 1951, Logan had a 46-game errorless streak, from May 13 through June 24th. That single error was his only misstep of the season. The Braves were watching him closely, and Logan earned his ticket to Boston on the Fourth of July. 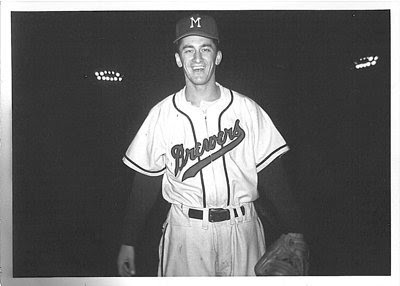 He played the rest of the season at Braves Field, but when 1952 started he was back at Borchert's Orchard. 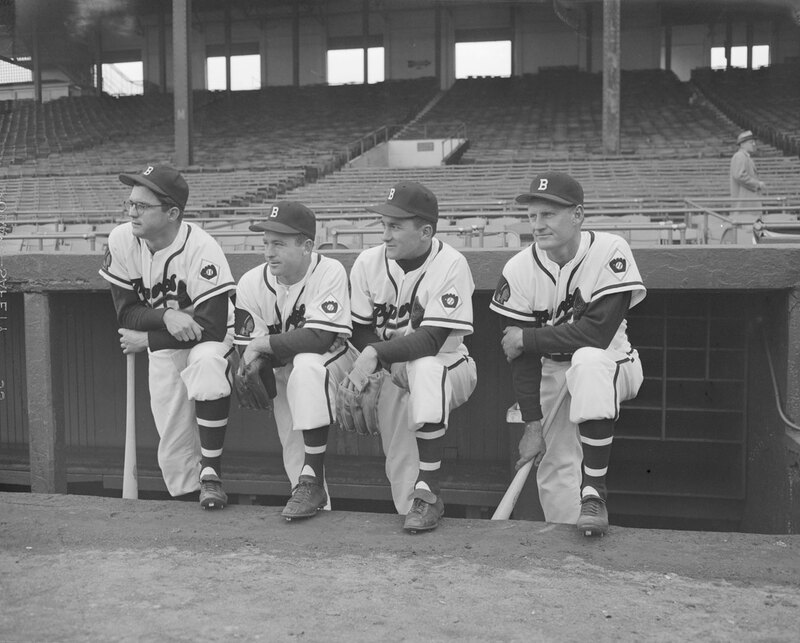 The Braves had a new manager that season in Tommy Holmes, and a new shortstop named Jack Cusick, a sophomore acquired from the Chicago Cubs. Both had a short tenure in Boston, as Holmes was fired on May 31st. Holmes was replaced by Brewers skipper Charlie Grimm, who immediately called up his regular shortstop. 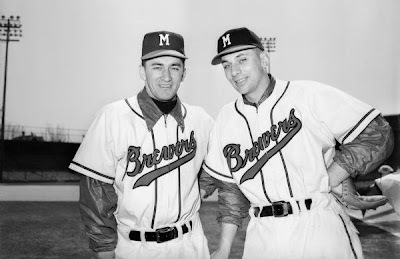 When Johnny next returned to Milwaukee, it was with the rest of the Braves, moving in to the brand-new County Stadium days before the start of the 1953 season. 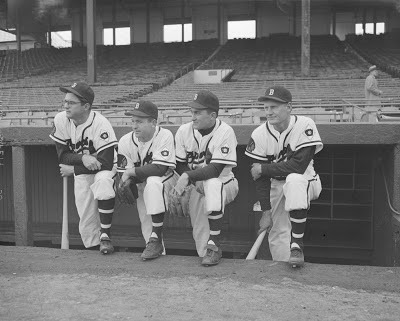 Logan's time with the Milwaukee Braves is well-documented. 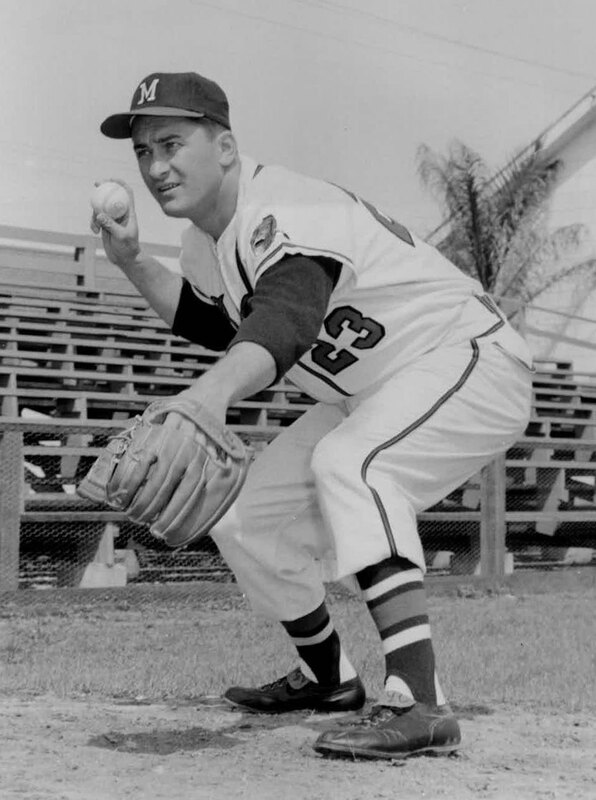 He anchored the infield for a decade, and was a key member of the World Champion squad in 1957. 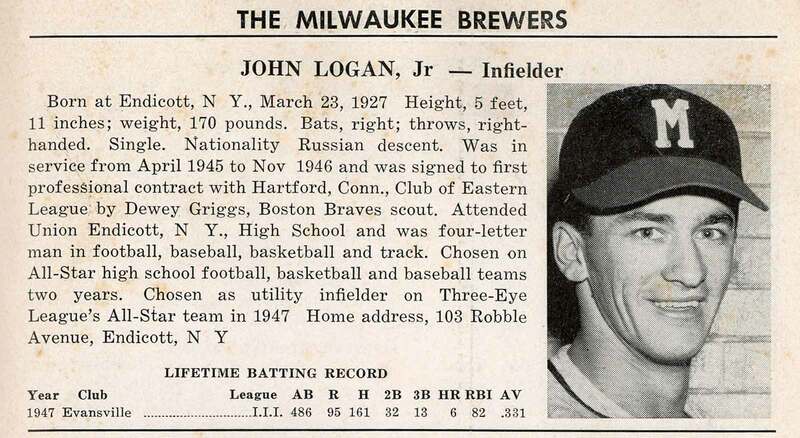 Logan finished his career with a four-year stint in Pittsburgh (1961-63) and one with Japan's Nankai Hawks (1964). After hanging up his glove he returned to Milwaukee, where he hosted a sports radio show on WOKY. He moved into television in 1973 as the color commentator for the new American League Milwaukee Brewers. 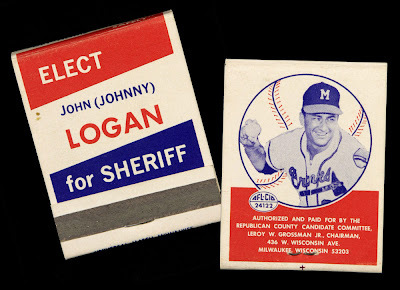 Logan tried his hand at politics, unsuccessfully running for Milwaukee County Sheriff three times: 1966, 1968 and 1978. This matchbook is from the 1968 campaign, the only time he ran as a Republican. It seems that Braves nostalgia was already pretty deep in Milwaukee County, to be featured so prominently. This was just a few years after the club moved to Atlanta, and would have obviously been fresh in fans' minds during the dark period between the loss of the Braves and the coming of the new Brewers. 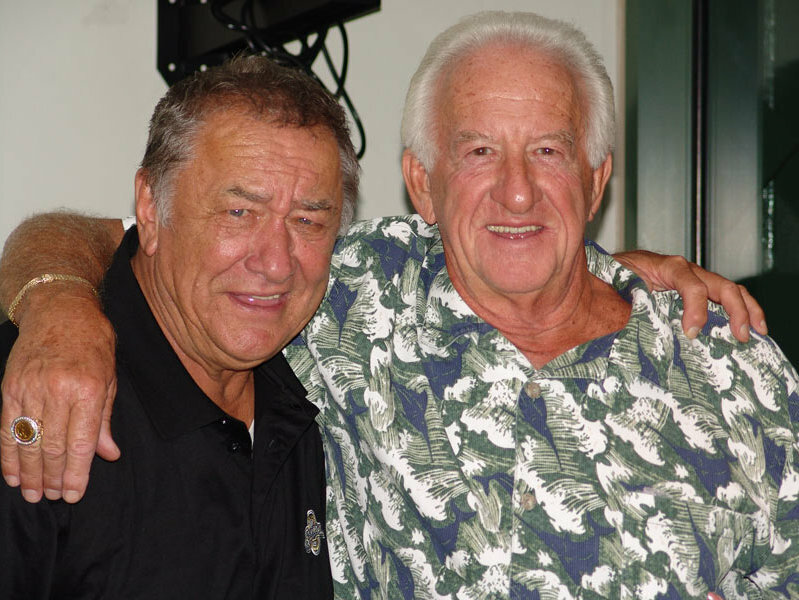 After the death of his wife in 1989, and at the suggestion of former Braves teammate and longtime friend Bob Uecker, Logan began working for the Brewers as a radar gun operator. He sat behind home plate, clocking every pitch (and, no doubt, greeting Milwaukee baseball fans). He later moved on to scouting for the Brewers. Logan has been a key player in keeping Milwaukee baseball memories alive. He is frequently sought out for interviews about both the Braves and the old Brewers. 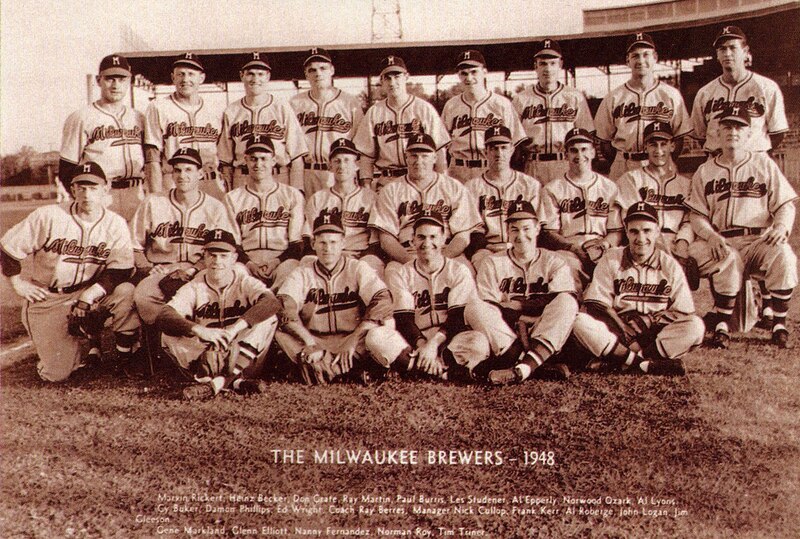 In 1999, he co-founded the Milwaukee Braves Historical Association. With that group, Logan conceived of and raised funds for a monument to the Braves outside Miller Park, a monument that was unveiled in of 2002. As awareness of the American Association Brewers has increased, Logan has also become a stand-in for his original Milwaukee club. When the Brewers sponsored an historical marker to commemorate the site of Borchert Field in 2008, Logan attended the ceremony to represent the Brews. I hope that the old Brewers don't go unmentioned at tomorrow's ceremony. But even if they do, we'll know. And we'll help keep those memories alive, with the help of our very own "Johnny Brewer".